The current Communist Party of Australia (CPA) is a minor political party in Australia which was founded in 1971 as the Socialist Party of Australia (SPA) by former members of the Communist Party of Australia who resigned or were expelled from that party as a result of their opposition to policy changes. The revived Communist Party remains a traditional, albeit small, Communist Party, proclaiming itself to be a Marxist–Leninist party whose ultimate objective is the revolutionary transformation of Australian society and the establishment of socialism in Australia. It describes its objective as being to "change the direction of politics in Australia and eventually, to replace the capitalist system with a socialist one." In the late 1960s, the CPA, under the leadership of National Secretary Laurie Aarons, became a strong supporter of "Eurocommunism", of abandoning Leninism and democratic centralism, and trying to form a "united front" of the various left-wing forces thrown up by the movement of opposition to the Vietnam War. The CPA leadership had become increasingly critical of the Soviet Union, particularly over the 1968 Warsaw Pact invasion of Czechoslovakia. The dissidents took the view that the CPA should not become a left social-democratic party, and should continue as a Marxist–Leninist party. The group was described as pro-Soviet hardliners. Their position put them at odds with the CPA leadership. The SPA was led by a group of veteran trade union officials such as Pat Clancy and Peter Symon. Clancy resigned from the SPA in 1983, and Symon was the general secretary from its formation until his death in December 2008, a total of 36 years. After Symon's death, party president, Hannah Middleton, was elected general secretary by the 11th Party National Congress in October 2009. Vinicio Molina succeeded Middleton as party president. Bob Briton was elected General Secretary at the 12th Party Congress in 2013. The old CPA was dissolved in 1991. 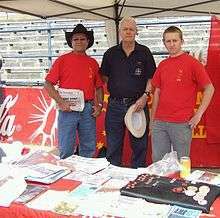 The SPA, believing itself to be the rightful successor to the original CPA formed in 1920, changed its name to Communist Party of Australia at its 8th Party National Congress in October 1996. The Communist Party of Australia has announced that they will run candidates in the 2016 federal election. ". ↑ "The Communists". Australian Electoral Commission. 30 May 2012.